Did you know that there is an add-on for the Amiga CD32 that allows you to watch movies in the Video CD (VCD) format? 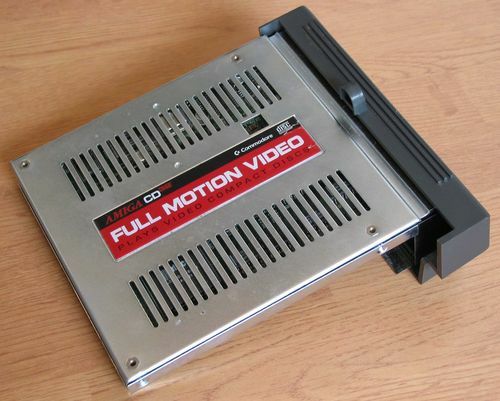 This upgrade is called the Full Motion Video (FMV) Module and was released by Commodore in 1994. It allows you to play CD-i Digital Video and Video CD’s (MPEG 1). As far as I know, the Video CD format never caught on like the VHS and the DVD. Even though it was an OK format that had a lot of advantages over tapes, most people stuck with their VHS-tapes until the DVD entered the arena. Still, there’s a lot of different movies available on the Internet. As you may know, Commodore went bust in 1994, and the production of FMV units was halted along with everything else. The upgrade is therefore a bit tricky to find, but it shows up occasionally on sites like AmiBay and e-Bay. Due to its rarity it is quite expensive. Now, what does this card look like? I found the picture below at the excellent Amiga History Guide website. Have a look! The video doesn’t show much of the movie though, but enough to see that it is working. I’d love to own one of these precious cards, but they’re a bit expensive, so I’m holding back at the moment. Anyone out there that owns one? If yes, how did you get hold of it and do you use it? 🙂 What’s the video quality like? Hope to hear from you concerning this. Thanks. I don’t own the FMV unit, but I saw one in action at an Amiga show back in 1996/97. The demo unit was placed next to a CDi for comparison. The playback on the CD32 seemed slightly smoother and less blocky. However, the difference may have been caused by different displays. The FMV unit is impressive when you take into account the limited H/W of the CD32. It would have been neat to see it used in more games. However, I think it’s a curioso nowdays with the advent of DVD/Blu-Ray. There’s little reason to track down VideoCDs or create your own MPG1 videos and I’m not entirely convinced that that VCDs will ever take on the cult status of LaserDisc. BTW, I’m the author of Amiga History Guide and wanted to thank you for referencing the site. It is much appreciated. As Coder said, your website is simply great. Have read a lot of interesting stuff there. It is also a valuable reference when writing articles about the Amiga. 🙂 Thanks for sharing all the stuff with us. I remember reading about it back in the day. Video CD was used a lot in Asia. When I asked the shop keeper about VHS cassettes he thought I lost it. 🙂 I even bought Pink Floyd – Pulse on Video CD for my wife. Interesting that the Video CD format was common in Asia. Is it still being used over there? Not really sure. It has been some time since I have been there. I think it is all DVD now. Thanks for the info mate. 🙂 Guess you’re right. DVD is still the standard. Wonder how long it will take before BlueRay for example takes over. I have an Amiga CD32 with the FMV module and a Philips CD-i with the FMV module. The Movies looks much better on an CD-i than an CD32. When you play VCD-Movies on the CD-i you have a menu where you can choose chapter etc and the subtitles for the Movie works. Then when you play a VCD-Movie on an CD32 it has no menu, no subtitels and the Picture is more blocky. Hi Roine! Thanks for the information concerning the Amiga CD32 versus the CD-i. Must say that the lack of subtitles sounds like a big drawback, which goes for the menus as well. I did not know the CD32 with the FMV lacked those features. I had the Amiga CD32 with FMV-module. I bought it at the same time as i bought the CD32. I still have the movies . It’s called CDi and it works great. I remember how impressed I was with the quality of the film. I payed about 1000$ for the Amiga CD32 with the FMV-module in Norway. If i remember correct I payed about 390$ just for the FMV-module upgrade back in the day. Hi there! Thanks for commenting and for sharing your experience with the FMV-module. 🙂 It sure costed quite a bit of cash back then. Which movies did you get for it? Hi 🙂 I got one recently, and the video is ok compared to at least the unofficial PSX VCD player cart I had. and have the FMV installed, you get full screen MPEG, but without it, you get CDXL playing in a small screen about 1/4 of the size. It took me a long time to get one (eBay), and I got ripped off on a dud one first. The FMV only seems to support Video CD version 1, which would explain some of the post above. I have a few Video CDs, but it’s mainly a collector thing for me. Something I always wanted back in the day. Hi Brek Martin and many thanks for commenting and of course for the info concerning the demo CD and FMV. 🙂 do you have other stuff for the CD32? Hi there. Seeing this has reminded me that I have a CD32 with FMV expansion in the spare bedroom somewhere. I bought them brand new back in the day. Think I still have the demo disc and some games too as well as some movies. What do you think it is worth? I’ve never seen the FMV expansion on Ebay so don’t have a clue what its worth. I guess I’m lucky as I own three FMV modules and they are probably worth a lot now considering the rarity factor. They are a nice item to own but one thing I’ve learned is they can be quite fragile as I have had to get all three of them repaired and recapped. I’ve also added heatsinks onto the chips as some of the chips like the CL450 burn hot and it’s life can be reduced if not cooled properly. Only the 7805 regulator should get warm. I have two of these now. The later ROM version in the FMV module itself does support a basic menu. Being the last Commodore product, work on the software was probably an ordeal 😀 For CD32 stuff, I also have the CD32 debug board for developers that adds an IDE interface among other things, and a CD error rate counter board used to test the CD drives in production. I’ve got YouTube videos showing all three of those things working. BTW if another chip in an FMV module is getting hot, Is replace all ceramic caps (the rye that aren’t usually replaced). They can go close to short circuit, in which case some chips will try to power themselves from their I/O pins.